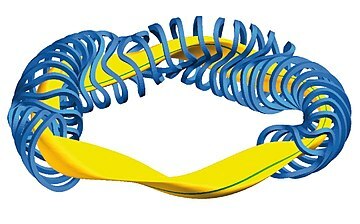 Example of a stellarator design, as used in the Wendelstein 7-X experiment: A series of magnet coils (blue) surrounds the plasma (yellow). A magnetic field line is highlighted in green on the yellow plasma surface. Wendelstein 7-X in Greifswald, Germany. 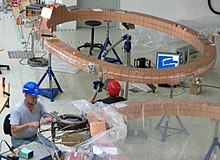 Coils are prepared for the experimental stellarator. A stellarator is a plasma device that relies primarily on external magnets to confine a plasma. In the future, scientists researching magnetic confinement fusion aim to use stellarator devices as a vessel for nuclear fusion reactions. The name refers to the possibility of harnessing the power source of the stars, including the sun. It is one of the earliest fusion power devices, along with the z-pinch and magnetic mirror. The stellarator was invented by Lyman Spitzer of Princeton University in 1951, and much of its early development was carried out by his team at what became the Princeton Plasma Physics Laboratory (PPPL). Lyman’s Model A began operation in 1953 and demonstrated that stellarators could confine plasmas. Larger models followed, but these demonstrated poor performance, suffering from a problem known as pump-out that caused them to lose plasma at rates far worse than theoretical predictions. By the early 1960s, any hope of quickly producing a commercial machine faded, and attention turned to studying the fundamental theory of high-energy plasmas. By the mid-1960s, Spitzer was convinced that the stellarator was matching the Bohm diffusion rate, which suggested it would never be a practical fusion device. The release of information on the USSR's tokamak design in 1968 indicated a leap in performance. This led to the Model C stellarator being converted to the Symmetrical Tokamak (ST) as a way to confirm or deny these results. ST confirmed them, and large-scale work on the stellarator concept ended as the tokamak got most of the attention. The tokamak ultimately proved to have similar problems to the stellarators, but for different reasons. Since the 1990s, this has led to renewed interest in the stellarator design. New methods of construction have increased the quality and power of the magnetic fields, improving performance. A number of new devices have been built to test these concepts. Major examples include Wendelstein 7-X in Germany, the Helically Symmetric Experiment (HSX) in the USA, and the Large Helical Device in Japan. 100 keV corresponds to a temperature of about a billion kelvins. Due to the Maxwell–Boltzmann statistics, a bulk gas at a much lower temperature will still contain some particles at these much higher energies. Because the fusion reactions release so much energy, even a small number of these reactions can release enough energy to keep the gas at the required temperature. In 1944, Enrico Fermi demonstrated that this would occur at a bulk temperature of about 50 million Celsius, still very hot but within the range of existing experimental systems. The key problem was confining such a plasma; no material container could withstand those temperatures. But because plasmas are electrically conductive, they are subject to electric and magnetic fields which provide a number of solutions. In a magnetic field, the electrons and nuclei of the plasma circle the magnetic lines of force. One way to provide some confinement would be to place a tube of fuel inside the open core of a solenoid. A solenoid creates magnetic lines running down its center, and fuel would be held away from the walls by orbiting these lines of force. But such an arrangement does not confine the plasma along the length of the tube. The obvious solution is to bend the tube around into a torus (donut) shape, so that any one line forms a circle, and the particles can circle forever. However, this solution does not actually work. For purely geometric reasons, the magnets ringing the torus are closer together on the inside curve, inside the "donut hole". Fermi noted this would cause the electrons to drift away from the nuclei, eventually causing them to separate and cause large voltages to develop. The resulting electric field would cause the plasma ring inside the torus to expand until it hit the walls of the reactor. In the post-war era, a number of researchers began considering different ways to confine a plasma. George Paget Thomson of Imperial College London proposed a system now known as z-pinch, which runs a current through the plasma. Due to the Lorentz force, this current creates a magnetic field that pulls the plasma in on itself, keeping it away from the walls of the reactor. This eliminates the need for magnets on the outside, avoiding the problem Fermi noted. Various teams in the UK had built a number of small experimental devices using this technique by the late 1940s. Another person working on controlled fusion reactors was Ronald Richter, a former German scientist who moved to Argentina after the war. His thermotron used a system of electrical arcs and mechanical compression (sound waves) for heating and confinement. He convinced Juan Perón to fund development of an experimental reactor on an isolated island near the Chilean border. Known as the Huemul Project, this was completed in 1951. Richter soon convinced himself fusion had been achieved in spite of other people working on the project disagreeing. The "success" was announced by Perón on 24 March 1951, becoming the topic of newspaper stories around the world. The basic concept was a way to modify the torus layout so that it addressed Fermi's concerns though the device's geometry. By twisting one end of the torus compared to the other, forming a figure-8 layout instead of a circle, the magnetic lines no longer travelled around the tube at a constant radius, instead they moved closer and further from the torus' center. A particle orbiting these lines would find itself constantly moving in and out across the minor axis of the torus. The drift upward while it travelled through one section of the reactor would be reversed after half an orbit and it would drift downward again. The cancellation was not perfect, but it appeared this would so greatly reduce the net drift rates that the fuel would remain trapped long enough to heat it to the required temperatures. Magnetic confinement in the stellarator is based on a strong magnetic field produced by solenoidal coils encircling a toroidal tube. The configuration is characterized by a 'rotational transform', such that a single line of magnetic force, followed around the system, intersects a cross-sectional plane in points which successively rotate about the magnetic axis. ... A rotational transform may be generated either by a solenoidal field in a twisted, or figure-eight shaped, tube, or by the use of an additional transverse multipolar helical field, with helical symmetry. While working at Los Alamos in 1950, John Wheeler suggested setting up a secret research lab at Princeton University that would carry on theoretical work on H-bombs after he returned to the university in 1951. Spitzer was invited to join this program, given his previous research in interstellar plasmas. But by the time of his trip to Aspen, Spitzer had lost interest in bomb design and he turned his attention full-time to fusion as a power source. Over the next few months, Spitzer produced a series of reports outlining the conceptual basis for the stellarator, as well as potential problems. The series is notable for its depth; it not only included a detailed analysis of the mathematics of the plasma and stability but also outlined a number of additional problems like heating the plasma and dealing with impurities. With this work in hand, Spitzer began to lobby the Department of Energy (DOE) for funding to develop the system. He outlined a plan involving three stages. The first would see the construction of a Model A, whose purpose was to demonstrate that a plasma could be created and that its confinement time was better than a torus. If the A model was successful, the B model would attempt to heat the plasma to fusion temperatures. This would be followed by a C model, which would attempt to actually create fusion reactions at a large scale. This entire series was expected to take about a decade. Around the same time, Jim Tuck had been introduced to the pinch concept while working at Clarendon Laboratory at Oxford University. He was offered a job in the US and eventually ended up at Los Alamos, where he acquainted the other researchers with the concept. When he heard Spitzer was promoting the stellarator, he also travelled to Washington to propose building a pinch device. He considered Spitzer's plans "incredibly ambitious." Nevertheless, Spitzer was successful in gaining $50,000 in funding from the DOE, while Tuck received nothing. The Princeton program was officially created on 1 July 1951. Spitzer, an avid mountain climber,[c] proposed the name "Project Matterhorn" because he felt "the work at hand seemed difficult, like the ascent of a mountain." Two sections were initially set up, S Section working on the stellarator under Spitzer, and B Section working on bomb design under Wheeler. Matterhorn was set up at Princeton's new Forrestal Campus, a 825 acres (334 ha) plot of land the University purchased from the Rockefeller Institute for Medical Research when Rockefeller relocated to Manhattan. [d] The land was located about 3 miles (4.8 km) from the main Princeton campus and already had sixteen laboratory buildings. Spitzer set up the top-secret S Section in a former rabbit hutch. It was not long before the other labs began agitating for their own funding. Tuck had managed to arrange some funding for his Perhapsatron through some discretionary budgets at LANL, but other teams at LANL, Berkeley and Oak Ridge (ORNL) also presented their ideas. The DOE eventually organized a new department for all of these projects, becoming "Project Sherwood". With the funding from the DOE, Spitzer began work by inviting James Van Allen to join the group and set up an experimental program. Allen suggested starting with a small "tabletop" device. This led to the Model A design, which began construction in 1952. It was made from 5-centimetre (2.0 in) pyrex tubes about 350 cm (11.5 ft) in total length, and magnets capable of about 1,000 gauss. The machine began operations in early 1953 and clearly demonstrated improved confinement over the simple torus. This led to the construction of the Model B, which had the problem that the magnets were not well mounted and tended to move around when they were powered to their maximum capacity of 50,000 gauss. A second design also failed for the same reason, but this machine demonstrated several-hundred-kilovolt X-rays that suggested good confinement. The lessons from these two designs led to the B-1, which used ohmic heating (see below) to reach plasma temperatures around 100,000 degrees. This machine demonstrated that impurities in the plasma caused large x-ray emissions that rapidly cooled the plasma. In 1956, B-1 was rebuilt with an ultra-high vacuum system to reduce the impurities but found that even at smaller quantities they were still a serious problem. Another effect noticed in the B-1 was that during the heating process, the particles would remain confined for only a few tenths of a millisecond, while once the field was turned off, any remaining particles were confined for as long as 10 milliseconds. This appeared to be due to "cooperative effects" within the plasma. Two additional machines were built to study pulsed operation. B-64 was completed in 1955, essentially a larger version of the B-1 machine but powered by pulses of current that produced up to 15,000 gauss. This machine included a diverter, which removed impurities from the plasma, greatly reducing the x-ray cooling effect seen on earlier machines. B-64 included straight sections in the curved ends which gave it a squared-off appearance. This appearance led to its name, it was a "figure-8, squared", or 8 squared, or 64. This led to experiments in 1956 where the machine was re-assembled without the twist in the tubes, allowing the particles to travel without rotation. B-65, completed in 1957, was built using the new "racetrack" layout. This was the result of the observation that adding helical coils to the curved portions of the device produced a field that introduced the rotation purely through the resulting magnetic fields. This had the added advantage that the magnetic field included shear, which was known to improve stability. B-3, also completed in 1957, was a greatly enlarged B-2 machine with ultra-high vacuum and pulsed confinement up to 50,000 gauss and projected confinement times as long as 0.01 second. The last of the B-series machines was the B-66, completed in 1958, which was essentially a combination of the racetrack layout from B-65 with the larger size and energy of the B-3. Unfortunately, all of these larger machines demonstrated a problem that came to be known as "pump out". This effect was causing plasma drift rates that were not only higher than classical theory suggested but also much higher than the Bohm rates. B-3's drift rate was a full three times that of the worst-case Bohm predictions, and failed to maintain confinement for more than a few tens of microseconds. As early as 1954, as research continued on the B-series machines, the design of the Model C device was becoming more defined. It emerged as a large racetrack-layout machine with multiple heating sources and a diverter, essentially an even larger B-66. Construction began in 1958 and was completed in 1961. It could be adjusted to allow a plasma minor axis between 5 and 7.5 centimetres (2.0 and 3.0 in) and was 1,200 cm (470 in) in length. The toroidal field coils normally operated at 35,000 gauss. By the time Model C began operations, information collected from previous machines was making it clear that it would not be able to produce large-scale fusion. Ion transport across the magnetic field lines was much higher than classical theory suggested. Greatly increased magnetic fields of the later machines did little to address this, and confinement times simply were not improving. Attention began to turn to a much greater emphasis on the theoretical understanding of the plasma. In 1961, Melvin B. Gottlieb took over the Matterhorn Project from Spitzer, and on 1 February the project was renamed as the Princeton Plasma Physics Laboratory (PPPL). Continual modification and experimentation on the Model C slowly improved its operation, and the confinement times eventually increased to match that of Bohm predictions. New versions of the heating systems were used that slowly increased the temperatures. Notable among these was the 1964 addition of a small particle accelerator to accelerate fuel ions to high enough energy to cross the magnetic fields, depositing energy within the reactor when they collided with other ions already inside. This method of heating, now known as neutral beam injection, has since become almost universal on magnetic confinement fusion machines. In 1968, scientists in the Soviet Union released the results of their tokamak machines, notably their newest example, T-3. The results were so startling that there was widespread scepticism. To address this, the Soviets invited a team of experts from the United Kingdom to test the machines for themselves. Their tests, made using a laser-based system developed for the ZETA reactor in England, verified the Soviet claims of electron temperatures of 1,000 eV. What followed was a "veritable stampede" of tokamak construction worldwide. At first the US labs ignored the tokamak; Spitzer himself dismissed it out of hand as experimental error. However, as new results came in, especially the UK reports, Princeton found itself in the position of trying to defend the stellarator as a useful experimental machine while other groups from around the US were clamoring for funds to build tokamaks. In July 1969 Gottlieb had a change of heart, offering to convert the Model C to a tokamak layout. In December it was shut down and reopened in May as the Symmetric Tokamak (ST). The ST immediately matched the performance being seen in the Soviet machines, besting the Model C's results by over ten times. From that point, PPPL was the primary developer of the tokamak approach in the US, introducing a series of machines to test various designs and modifications. The Princeton Large Torus of 1975 quickly hit several performance numbers that were required for a commercial machine, and it was widely believed the critical threshold of breakeven would be reached in the early 1980s. What was needed was larger machines and more powerful systems to heat the plasma to fusion temperatures. Tokamaks are a type of pinch machine, differing from earlier designs primarily in the amount of current in the plasma: above a certain threshold known as the safety factor, or q, the plasma is much more stable. ZETA ran at a q around ​1⁄3, while experiments on tokamaks demonstrated it needs to be at least 1. Machines following this rule showed dramatically improved performance. However, by the mid-1980s the easy path to fusion disappeared; as the amount of current in the new machines began to increase, a new set of instabilities in the plasma appeared. These could be addressed, but only by greatly increasing the power of the magnetic fields, requiring superconducting magnets and huge confinement volumes. The cost of such a machine was such that the involved parties banded together to begin the ITER project. As the problems with the tokamak approach grew, there was renewed interest in the stellarator approach. This coincided with the development of advanced computer aided design tools that allowed the construction of complex magnets that were previously known but considered too difficult to design and build. New materials and methods of construction have increased the quality and power of the magnetic fields, improving performance. A number of new devices have been built to test these concepts. Major examples include Wendelstein 7-X in Germany, the Helically Symmetric Experiment (HSX) in the USA, and the Large Helical Device in Japan. W7X and LHD use superconducting magnetic coils. The lack of an internal current eliminates some of the instabilities of the tokamak, meaning the stellarator should be more stable at similar operating conditions. On the downside, since no confinement is provided by the current found in a tokamak, the stellarator requires more powerful magnets to reach any given confinement. The stellarator is an inherently steady-state machine, which has several advantages from an engineering standpoint. Heating a gas increases the energy of the particles within it, so by heating a gas into the hundreds of millions of degrees, the majority of the particles within it would reach the energy required to fuse. According to the Maxwell–Boltzmann distribution, some of the particles will reach the required energies at much lower average temperatures. Because the energy released by the reaction is much greater than what it takes to start it, even a small number of reactions can heat surrounding fuel until it fuses as well. In 1944, Enrico Fermi calculated the D-T reaction would be self-sustaining at about 50,000,000 degrees Celsius (90,000,000 degrees Fahrenheit). Materials heated beyond a few tens of thousand degrees ionize into their electrons and nuclei, producing a gas-like state of matter known as plasma. According to the ideal gas law, like any hot gas, plasma has an internal pressure and thus wants to expand. For a fusion reactor, the challenge is to keep the plasma contained; any known substance would melt at these temperatures. But because a plasma is electrically conductive, it is subject to electric and magnetic fields. In a magnetic field, the electrons and nuclei orbit around the magnetic field lines, confining them to the area defined by the field. A simple confinement system can be made by placing a tube inside the open core of a solenoid. The tube can be evacuated and then filled with the requisite gas and heated until it becomes a plasma. The plasma naturally wants to expand outwards to the walls of the tube, as well as move along it, towards the ends. The solenoid creates magnetic field lines running down the center of the tube, and the plasma particles orbit these lines, preventing their motion towards the sides. Unfortunately, this arrangement would not confine the plasma along the length of the tube, and the plasma would be free to flow out the ends. The obvious solution to this problem is to bend the tube around into a torus (a ring or donut) shape. Motion towards the sides remains constrained as before, and while the particles remain free to move along the lines, in this case, they will simply circulate around the long axis of the tube. But, as Fermi pointed out,[g] when the solenoid is bent into a ring, the electrical windings would be closer together on the inside than the outside. This would lead to an uneven field across the tube, and the fuel will slowly drift out of the center. Since the electrons and ions would drift in opposite directions, this would lead to a charge separation and electrostatic forces that would eventually overwhelm the magnetic force. Some additional force needs to counteract this drift, providing long-term confinement. Spitzer's key concept in the stellarator design is that the drift that Fermi noted could be canceled out through the physical arrangement of the vacuum tube. In a simple torus, particles on the inside edge of the tube, where the field was stronger, would drift up, while those on the outside would drift down (or vice versa). However, if the particle were made to alternate between the inside and outside of the tube, the drifts would cancel out. The cancellation is not perfect, leaving some net drift, but basic calculations suggested drift would be lowered enough to confine plasma long enough to heat it sufficiently. Spitzer's suggestion for doing this was simple. Instead of a normal torus, the device would essentially be cut in half to produce two half-tori. They would then be joined with two straight sections between the open ends. The key was that they were connected to alternate ends so that the right half of one of the tori was connected to the left of the other. The resulting design resembled a figure-8 when viewed from above. Because the straight tubes could not pass through each other, the design did not lay flat, the tori at either end had to be tilted. This meant the drift cancellation was further reduced, but again, calculations suggested the system would work. To understand how the system works to counteract drift, consider the path of a single particle in the system starting in one of the straight sections. If that particle is perfectly centered in the tube, it will travel down the center into one of the half-tori, exit into the center of the next tube, and so on. This particle will complete a loop around the entire reactor without leaving the center. Now consider another particle traveling parallel to the first, but initially located near the inside wall of the tube. In this case, it will enter the outside edge of the half-torus and begin to drift down. It exits that section and enters the second straight section, still on the outside edge of that tube. However, because the tubes are crossed, when it reaches the second half-torus it enters it on the inside edge. As it travels through this section it drifts back up. This effect would reduce one of the primary causes of drift in the machine, but there were others to consider as well. Although the ions and electrons in the plasma would both circle the magnetic lines, they would do so in opposite directions, and at very high rotational speeds. This leads to the possibility of collisions between particles circling different lines of force as they circulate through the reactor, which due to purely geometric reasons, causes the fuel to slowly drift outward. This process eventually causes the fuel to either collide with the structure or cause a large charge separation between the ions and electrons. Spitzer introduced the concept of a divertor, a magnet placed around the tube that pulled off the very outer layer of the plasma. This would remove the ions before they drifted too far and hit the walls. It would also remove any heavier elements in the plasma. Using "classical" calculations the rate of diffusion through collisions was low enough that it would be much lower than the drift due to uneven fields in a normal toroid. But studies in 1949 demonstrated much higher losses and became known as Bohm diffusion. Spitzer spent considerable effort considering this issue, and concluded that the anomalous rate being seen by Bohm was due to instability in the plasma, which he believed could be addressed. Practical complications make the original figure-8 device less than ideal. This led to alternative designs and additions. One of the major concerns is that the magnetic fields in the system will only properly confine a particle of a given mass traveling at a given speed. Particles traveling faster or slower will not circulate in the desired fashion. Particles with very low speeds (corresponding to low temperatures) are not be confined and can drift out to the tube walls. Those with too much energy may hit the outside walls of the curved sections. To address these concerns, Spitzer introduced the concept of a divertor that would connect to one of the straight sections. This was essentially a mass spectrometer that would remove particles that were moving too fast or too slow for proper confinement. The physical limitation that the two straight sections cannot intersect means that the rotational transform within the loop is not a perfect 180 degrees, but typically closer to 135 degrees. This led to alternate designs in an effort to get the angle closer to 180. An early attempt was built into the Stellarator B-2, which placed both curved sections flat in relation to the ground, but at different heights. The formerly straight sections had additional curves inserted, two sections of about 45 degrees, so they now formed extended S-shapes. This allowed them to route around each other while being perfectly symmetrical in terms of angles. A better solution to the need to rotate the particles was introduced in the Stellarator B-64 and B-65. These eliminated the cross-over and flattened the device into an oval, or as they referred to it, a racetrack. The rotation of the particles was introduced by placing a new set of magnetic coils on the half-torus on either end, the corkscrew windings. The field from these coils mixes with the original confinement fields to produce a mixed field that rotates the lines of force through 180 degrees. This made the mechanical design of the reactor much simpler, but in practice, it was found that the mixed field was very difficult to produce in a perfectly symmetrical fashion. Unlike the z-pinch designs being explored in the UK and other US labs, the stellarator has no induced electrical current within the plasma - at a macroscopic level, the plasma is neutral and unmoving, in spite of the individual particles within it rapidly circulating. In pinch machines, and the later tokamaks, the current itself is one of the primary methods of heating the plasma. In the stellarator, no such natural heating source is present. Early stellarator designs used a system similar to those in the pinch devices to provide the initial heating to bring the gas to plasma temperatures. This consisted of a single set of windings from a transformer, with the plasma itself forming the secondary set. When energized with a pulse of current, the particles in the region are rapidly energized and begin to move. This brings additional gas into the region, quickly ionizing the entire mass of gas. This concept was referred to as ohmic heating because it relied on the resistance of the gas to create heat, in a fashion not unlike a conventional resistance heater. As the temperature of the gas increases, the conductivity of the plasma improves. This makes the ohmic heating process less and less effective, and this system is limited to temperatures of about 1 million kelvins. To heat the plasma to higher temperatures, a second heat source was added, the magnetic pumping system. This consisted of radio-frequency source fed through a coil spread along the vacuum chamber. The frequency is chosen to be similar to the natural frequency of the particles around the magnetic lines of force, the cyclotron frequency. This causes the particles in the area to gain energy, which causes them to orbit in a wider radius. Since other particles are orbiting their own lines nearby, at a macroscopic level, this change in energy appears as an increase in pressure. According to the ideal gas law, this results in an increase in temperature. Like the ohmic heating, this process also becomes less efficient as the temperature increases, but is still capable of creating very high temperatures. When the frequency is deliberately set close to that of the ion circulation, this is known as ion-cycloron resonance heating, although this name is not widely used. There are several ways to heat the plasma (which must be done before ignition can occur). The plasma is electrically conductive, and heats up when a current is passed through it (due to electrical resistance). Only used for initial heating, as the resistance is inversely proportional to the plasma temperature. The plasma absorbs energy when electromagnetic waves are applied to it (in the same manner as food in a microwave). A neutral particle beam injector makes ions and accelerates them with an electric field. To avoid being affected by the Stellarator's magnetic field, the ions must be neutralised. Neutralised ions are then injected into the plasma. Their high kinetic energy is transferred to the plasma particles by collisions, heating them. The original figure-8 design that used geometry to produce the rotational transform of the magnetic fields. A toroidal or racetrack-shaped design with separate helical coils on either end to produce the rotation. A stellarator with continuous helical coils. It can also have the continuous coils replaced by a number of discrete coils producing a similar field. A stellarator in which a helical coil is used to confine the plasma, together with a pair of poloidal field coils to provide a vertical field. Toroidal field coils can also be used to control the magnetic surface characteristics. The Large Helical Device in Japan uses this configuration. A helical axis stellarator, in which the magnetic axis (and plasma) follows a helical path to form a toroidal helix rather than a simple ring shape. The twisted plasma induces twist in the magnetic field lines to effect drift cancellation, and typically can provide more twist than the Torsatron or Heliotron, especially near the centre of the plasma (magnetic axis). The original Heliac consists only of circular coils, and the flexible heliac (H-1NF, TJ-II, TU-Heliac) adds a small helical coil to allow the twist to be varied by a factor of up to 2. A helical advanced stellarator, using an optimized modular coil set designed to simultaneously achieve high plasma, low Pfirsch–Schluter currents and good confinement of energetic particles; i.e., alpha particles for reactor scenarios. The Helias has been proposed to be the most promising stellarator concept for a power plant, with a modular engineering design and optimised plasma, MHD and magnetic field properties. 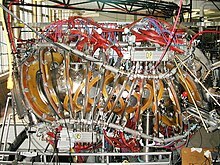 The Wendelstein 7-X device is based on a five field-period Helias configuration. The goal of magnetic confinement devices is to minimise energy transport across a magnetic field. Toroidal devices are relatively successful because the magnetic properties seen by the particles are averaged as they travel around the torus. The strength of the field seen by a particle, however, generally varies, so that some particles will be trapped by the mirror effect. These particles will not be able to average the magnetic properties so effectively, which will result in increased energy transport. In most stellarators, these changes in field strength are greater than in tokamaks, which is a major reason that transport in stellarators tends to be higher than in tokamaks. University of Wisconsin electrical engineering Professor David Anderson and research assistant John Canik proved in 2007 that the Helically Symmetric eXperiment (HSX) can overcome this major barrier in plasma research. The HSX is the first stellarator to use a quasisymmetric magnetic field. The team designed and built the HSX with the prediction that quasisymmetry would reduce energy transport. As the team's latest research showed, that is exactly what it does. "This is the first demonstration that quasisymmetry works, and you can actually measure the reduction in transport that you get," says Canik. The newer Wendelstein 7-X in Germany was designed to be close to omnigeneity (a property of the magnetic field such that the mean radial drift is zero), which is a necessary but not sufficient condition for quasisymmetry; that is, all quasisymmetric magnetic fields are omnigenous, but not all omnigenous magnetic fields are quasisymmetric. ^ Extensive studies in the 1970s lowered this slightly to about 70 keV. ^ Sources disagree on when the stellarator concept emerged in its current form, Bromberg puts the figure-8 arrangement being part of later work after he returned to Princeton. ^ The American Alpine Club has an annual Lyman Spitzer Cutting Edge Climbing Award. ^ Eventually becoming Rockefeller University. ^ The bulk temperature of the plasma was much lower, this was the temperature only within the heating section. ^ See diagram, Johnson page 58. ^ Andrei Sakharov also came to the same conclusion as Fermi as early as 1950, but his paper on the topic was not known in the west until 1958. ^ Clery, D. (2015). "The bizarre reactor that might save nuclear fusion". Science. doi:10.1126/science.aad4746. ^ a b Clery, D. (17 January 2013). "After ITER, Many Other Obstacles for Fusion Power". Science. ^ McCracken & Stott 2012, p. 35. ^ Stix 1998, p. 3. ^ a b c Bromberg 1982, p. 16. ^ a b Herman 1990, p. 40. ^ Mariscotti 1992, pp. 9-10. ^ Cabral 1987, p. 85. ^ Ellis 1958, p. 12. ^ Greenwald, J. (23 October 2013). "Celebrating Lyman Spitzer, the father of PPPL and the Hubble Space Telescope". Princeton Plasma Physics Lab. ^ Bromberg 1982, p. 17. ^ Spitzer 1958, p. 253. ^ Bromberg 1982, p. 14. ^ Herman 1990, p. 21. ^ a b Stix 1998. ^ a b Bromberg 1982, p. 21. ^ Herman 1990, p. 23. ^ Tanner, Earl (1982). Project Matterhorn: An Informal History. Princeton University. p. 36. ^ a b c d Timeline. ^ a b Stix 1998, p. 6. ^ a b Ellis 1958, p. 13. ^ a b c Ellis 1958, p. 14. ^ a b c d Stix 1998, p. 7. ^ "Neutral beam powers into the record books". 9 July 2012. Archived from the original on 24 March 2017. ^ Johnson 1982, p. 4. ^ Asimov 1972, p. 123. ^ Bishop 1958, p. 7. ^ Thomson 1958, p. 12. ^ Bishop 1958, p. 17. ^ a b c Spitzer 1958. ^ Furth 1981, p. 275. ^ Spitzer, L. (1960). "Particle Diffusion across a Magnetic Field". Physics of Fluids. 3 (4): 659–651. Bibcode:1960PhFl....3..659S. doi:10.1063/1.1706104. ^ Spitzer 1958, p. 187. ^ Spitzer 1958, p. 188. ^ Spitzer 1958, p. 189. ^ Wakatani, M. (1998). Stellarator and Heliotron Devices. Oxford University Press. ISBN 978-0-19-507831-2. ^ Harris, J. H.; Cantrell, J. L.; Hender, T. C.; Carreras, B. A.; Morris, R. N. (1985). "A flexible heliac configuration". Nuclear Fusion. 25 (5): 623. doi:10.1088/0029-5515/25/5/005. ^ Canik, J. M.; et al. (2007). "Experimental Demonstration of Improved Neoclassical Transport with Quasihelical Symmetry". Physical Review Letters. 98 (8): 085002. Bibcode:2007PhRvL..98h5002C. doi:10.1103/PhysRevLett.98.085002. PMID 17359105. ^ Seely, R. (12 April 2011). "UW scientists see a future in fusion". Wisconsin State Journal. ^ "Omnigeneity". FusionWiki. Retrieved 31 January 2016. Asimov, Isaac (1972). Worlds Within Worlds: The Story of Nuclear Energy. U.S. Atomic Energy Commission. Bishop, Amasa (1958). Project Sherwood; the U.S. program in controlled fusion. Addison-Wesley. Bromberg, Joan Lisa (1982). Fusion: Science, Politics, and the Invention of a New Energy Source. MIT Press. ISBN 9780262021807. Herman, Robin (1990). Fusion: the search for endless energy. Cambridge University Press. ISBN 9780521383738. Johnson, John (December 1982). The Stellarator Approach to Toroidal Plasma Confinement (PDF) (Technical report). Princeton University, Plasma Physics Laboratory. Spitzer, Lyman (23 July 1951). A Proposed Stellarator (PDF) (Technical report). Project Matterhorn. Spitzer, Lyman (1958). "The Stellarator Concept". Physics of Fluids. 1 (4): 253–264. Bibcode:1958PhFl....1..253S. doi:10.1063/1.1705883. Stix, Thomas (1998). "Highlights in Early Stellarator Research at Princeton" (PDF). Journal of Plasma Fusion Research Series. 1: 3–8. "Timeline". Princeton Plasma Physics Laboratory. Wikimedia Commons has media related to Stellarators.